Get your ultimate snug fit with the Yonex SHB SC6i EX men’s badminton shoes that are perfect for indoor courts. Their upper features the Tough Guard™ III design making the material 3 times stronger and more resistant against heat than regular synthetic leather. Yonex’s new Quattro Fit system reduces the excess space at the front and reshapes the heel and mid-foot to hold your foot more firmly for a faster response. The EVA midsole incorporates the 3-layer Power Cushion absorbing 30% more shocks and providing more repulsion and enhanced energy transfer. Also, there is a super-light Power Graphite Lite plate enhancing stability and a Syncro-Fit insole creating an improved fit between your foot and the shoe. The lightweight rubber outsole maximises support and has the Hexagrip pattern that makes the high-quality shoe grippier. Very comfortable, reasonably light, good construction. As someone who has suffered from shin splints in the past, these shoes give excellent arch support and heel cushioning. they also hold the foot tightly which stops the foot moving about inside the shoe. I can highly recommend these. 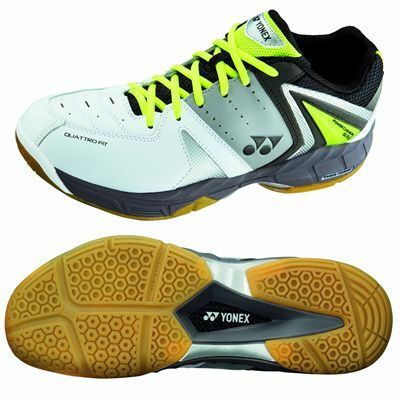 for submitting product review about Yonex SHB SC6i EX Mens Badminton Shoes.